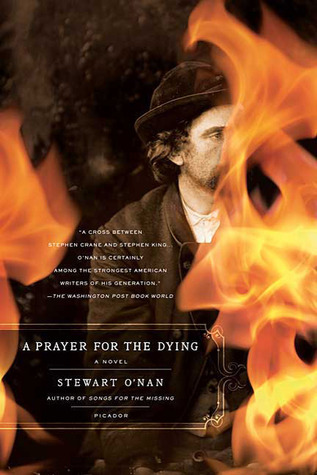 Set just after the Civil War, A Prayer for the Dying is the story of a small Wisconsin town gripped by a mysterious, deadly epidemic, and one man desperate to save it. Torn between his loyalty to his family, his faith in God, and his terror of this vicious disease, Jacob Hansen struggles to preserve his sanity amid the chaos and violence around him. This is the second O’Nan book I’ve read, after Last Night at the Lobster (several years ago). O’Nan has an unobtrusive writing style and tightly controlled pacing, at least in these two books of his. A Prayer for the Dying is a chilling gothic tale, based on the real-life events that took place in Black River Falls, Wisconsin in the 1890s—a diphtheria epidemic while townspeople were randomly going insane and becoming violent—recorded in the 1973 Michael Lesy book Wisconsin Death Trip and 1999 documentary. Jacob Hansen has three roles in Friendship: preacher, undertaker, and sheriff. What starts as a beautiful summer day in this rural community quickly becomes hellish beyond belief after Jacob is alerted to a dead soldier on the outskirts of town. As he’s transporting the body to the town doctor, Jacob comes upon a woman suffering from mental and physical illnesses. Jacob goes from beloved confidant and friendly neighbor to hated jailer in the blink of an eye when he enacts a town quarantine—no one in, no one out. Not long after, Jacob learns a forest fire is rapidly approaching Friendship. Jacob’s faced with impossible, no-win choices, left to question his faith and humanity. O’Nan’s novel (practically a novella, at 195 pages) simmers slowly to a full boil of futility and hopelessness. The reader becomes especially immersed in the small town of Friendship and Jacob’s experiences through the second-person narrative. Jacob’s descent into madness is heartbreaking and disquieting. It’s a powerful and disturbing book, despite it’s short length. Read from November 30 to December 2, 2013. This entry was posted in books and tagged drama, fiction, health, horror, literature, midwest, society, survival by kristin @ my little heart melodies. Bookmark the permalink.